CBDistellery specializes in bringing CBD products to consumers. They have an online store with many options of CBD products. I am very new to the world of CBD and my interest is definitely piqued with it. This CBDistellery review will reveal my experience with their products. Truth be told, I have been suffering from debilitating anxiety and depression symptoms for several years and I am desperate for relief. Medications do not remedy my problems, they only slightly mask the symptoms. I have heard so many wonderful things about CBD to remedy anxiety and depression so I was thrilled at the thought of doing this CBDistellery review to see their products can help me out in any way. I also wanted to test their products to see if they could remedy my insomnia. I am not going to get into too much of the technical side of CBD here. This post is a review of their products and how each product helped me. This post is about my experience using products from CBDistellery. I am not a medical professional and this review is not to be taken as medical advice. If you have health concerns please address them with your physician and consult your doctor before taking any CBD products mentioned within this review.. Wondering what exactly CBD is? I was too and then I did a bit of research to educate myself on how and why CBD works. For this CBDistellery review I did read up on CBD so I could educate myself on the topic. CBD (also known as Cannabidiol) is a non-psychoactive substance and it does not contain any THC that will get you stoned. There are many health benefits that come along with using CBD. It really truly is a miracle product! With CBD, each and everyone is different and unique in what dosage works for you. Many people feel the benefits of CBD with only a small dose. There is no actual recommended starting dose for anyone. My best advice with CBD is to just start small and see how your body and mind reacts to it. Each individual determines the dosage that works best for them. You can use CBDistellery products with great confidence because they are ranked #3 in the world for best CBD. That is a huge honor because there is a ton of CBD popping up everywhere and all over the place these days. To learn more about CBDistellery products they have a very handy FAQ page on their website. Watch this informative 90-second video to learn more. The online reviews of CBDistellery are quite stellar. You can have peace of mine consuming their products once you read the rave reviews. I was curious to see what the lab results were for CBDistellery so I did a little Google searching and did view the lab results report. You can view the report HERE. I am also currently in the process of withdrawing from a benzodiazepine medication that I was prescribed for over 7 years. My taper from the benzo began with Klonopin and I am nearing the end of my taper with Valium. Some days the symptoms are unbearable. I get hit hard with withdrawal symptoms every single time I make a cut to near the end of my benzo taper. I wanted to see if CBD could relieve the worst of the withdrawal symptoms (anxiety and depression) so I gave some products a try from CBDistellery. Because there are no psychoactive effects of CBD I do not ever feel stoned or high after consuming any CBD product. For me, CBD calms me and balances me out. I use CBD products whenever I feel a hint of depression and anxiety. Shortly after consuming the CBD product I feel an improvement in my mood and I can get back to functioning properly. CBD is a lifesaver for me and I love that it is an all-natural remedy to my health concerns. I do not experience any side-effects after using a CBD product. Another problem that CBD helps me out with is insomnia. The CBD has proven to be more effective than a melatonin supplement for me. I tend to wake up several times in the middle of the night and CBD helped me get a better quality of sleep. I woke less in the middle of the night when I consumed CBD before bedtime. Each drop from the 1000mg vial of CBD tincture contains approximately 33.2mg of CBD to help with your health and wellbeing. Using these CBD drops is the way to go if you are a CBD virgin and not familiar with how CBD will affect you. It is always advised to start out small with CBD and then slowly work your way up. You can place a drop of oil under the tongue or mix it into a smoothie, etc. This tincture comes in a conveniently sized 30ml bottle. This is a pure and 100% natural way to relieve your symptoms. There are no added chemicals or dyes. Here is a link to the smallest tincture that CBDistellery has available and each drop is appx 8mg of CBD oil. This link here is for the 500mg bottle which has appx 17mg of CBD per dose. The tincture that I reviewed was a 1000mg bottle. If you are looking for a tincture that is more potent try this 2500mg oil. It contains appx 83mg of full spectrum hemp extract. CBDistellery softgels make it simple and easy to get your dose of CBD. Sometimes oil can be a mess or hassle if you are out and about. There is no mixing or measuring with the full spectrum CBD softgels from CBDistellery. Just pop one softgel in your mouth and swallow with water. Wait for the relief to set in. Want to give these CBD softgels a whirl? Shop HERE at CBDistellery. The 30mg CBD gummies by CBDistellery are my favorite of all the CBD products that I tried out. These CBD gummies not only taste great but they are highly effective. Each gummy is 30mg of high-quality, THC-free CBD and they have a fabulous fruity flavor. Curious about trying out these gummy CBD bears? Get your gummies HERE. The vape pen from CBDistellery is a fabulous little product that you can store in your purse or pocket when you are on-the-go! If you are looking for a high-quality CBD vape pen CBDistellery has got you covered with this. The vape was not my favorite method for getting CBD. It seems to hit pretty hard and it did make me cough a bit. If you are an experienced vaper that probably would not be a big deal to you. My husband is a vaper and he did not cough after hitting this vape pen. Ready to give this vape pen a whirl? Get yours HERE. We are excited to announce we have upgraded our entire CBD Vape Line by investing in luxury vape technology and a new, higher quality vape cutting agent (See Description below for more details). Granddaddy Purple was introduced in 2003 and gained immediate praise for its fragrant berry and grape aroma. We are bringing that pleasing scent to you now in our fast-acting, discreet, and effective 200mg CCELL Disposable CBD Vape Pen – Grand Daddy Purp. The 200mg size means you will have plenty of CBD to get you through every day with ease. Find out The healing power of salves has been around since man first started using plants for medicinal purposes. Crushing, grinding, and processing powerful herbs helps bring all their natural healing properties straight to your skin, making them far more effective and faster acting than simply eating them. Our 500mg CBDol Salve is a perfect localizing and eliminating your source of discomfort. This fast-acting topical method of using CBD will bring comfort and relief to the areas that it is rubbed on. This salve is perfect for relieving muscle aches and pains. Get yours HERE. I am very pleased with the items that I received from CBDistellery and I am going to use their products often to combat my anxiety and my depression symptoms. The products from CBDistellery work quickly and very effectively to put my body and my mind at ease. You will be pleasantly surprised by the wonderful products from CBDistellery. They also have reasonable prices offered in their online store and the shipping of their products was absolutely wonderful! Ready to shop at CBDistellery? Question Time! How will you use CBDistellery’s CBD to benefit your body and mind? Leave me a comment and let me know. I hope you enjoyed this CBDistellery review and it inspires you to give it a whirl! I WAS SENT PRODUCTS TO REVIEW. ALL OPINIONS ARE MY OWN. ALSO, THIS POST CONTAINS AFFILIATE LINKS. I DO RECEIVE A SMALL COMMISSION IF ITEMS ARE PURCHASED THROUGH THESE LINKS (no extra cost to you). I WAS SENT PRODUCTS FROM CBDISTELLERY TO REVIEW. ALL OPINIONS STATED HERE ARE MY OWN. 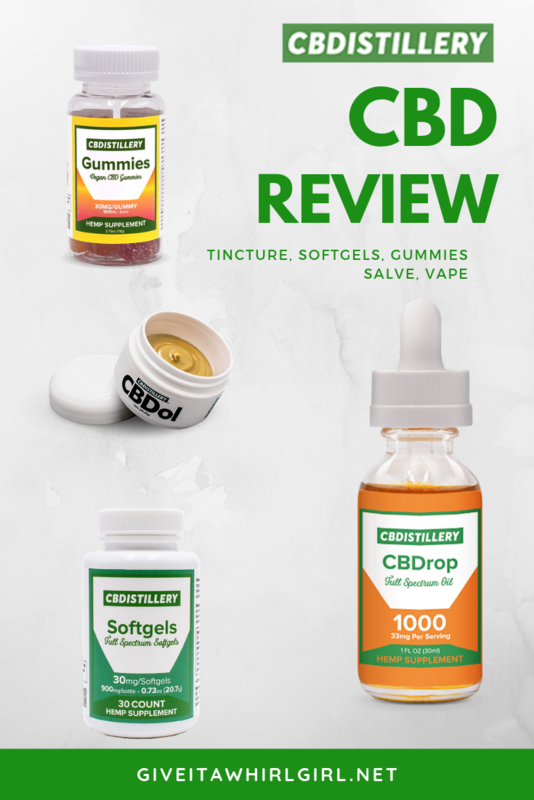 This entry was posted in Health and Wellness, Product Reviews and tagged CBD, CBD gummies, CBD oil, CBD salve, CBD softgels, CBD vape, CBDistellery, health, health benefits, mental health, natural remedy, product review, review, shopping, shopping guide, supplement. Bookmark the permalink. I heard good things about CBD oil, but I had never try it. Does it work with your anxiety very well? It helps tremendously. My anxiety gets dibilitating at times and CBD always rescues me and balances me out. CBD is a great remedy for pain. I have the lotion and it works. So glad to hear that CBD works for you. It really works for me too and I believe it is a miracle product! Wow who knew?! Good to know – thanks for sharing! I can see this really would have some great uses for some people. Very interesting. Wow, these sound like amazing products. I am not sure if we can get anything like this in Australia yet, but I would be interested! I’ve been so intrigued to try CBD gummies. Thanks for the info.